GeoDa was developed by Dr. Luc Anselin and his team. 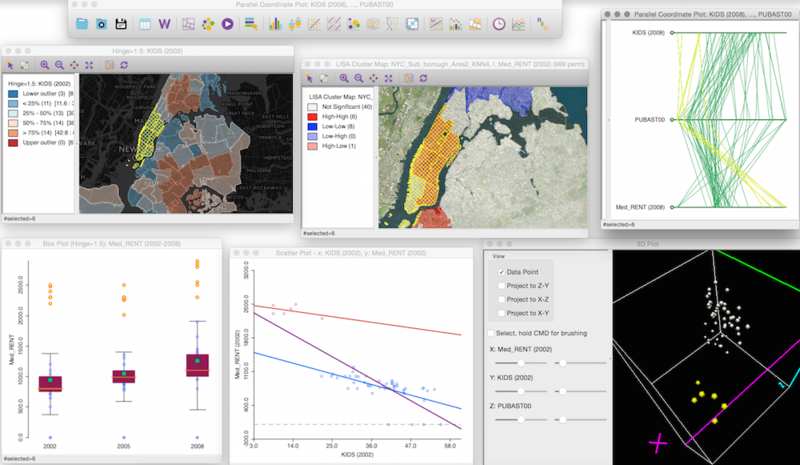 The program provides a user-friendly and graphical interface to methods of exploratory spatial data analysis (ESDA), such as spatial autocorrelation statistics for aggregate data (several thousand records), and basic spatial regression analysis for point and polygon data (tens of thousands of records). 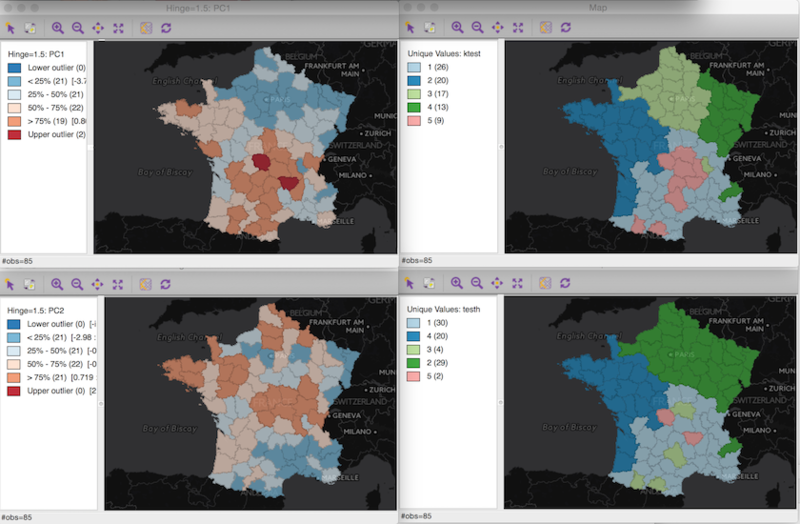 To work with big data in GeoDa it should first be aggregated to areal units. Since its initial release in February 2003, GeoDa's user numbers have increased exponentially to over 200,000 (June 2017). This includes lab users at universities such as Harvard, MIT, and Cornell. The user community and press embraced the program enthusiastically, calling it a "hugely important analytic tool," a "very fine piece of software," and an "exciting development." The latest version 1.10 contains several new local cluster features, including univariate and multivariate local Gear cluster maps and several classic non-spatial cluster techniques (principal component analysis, k-means, and hierarchical clustering) implemented in Hoon et al. 's (2013) C Clustering Library. 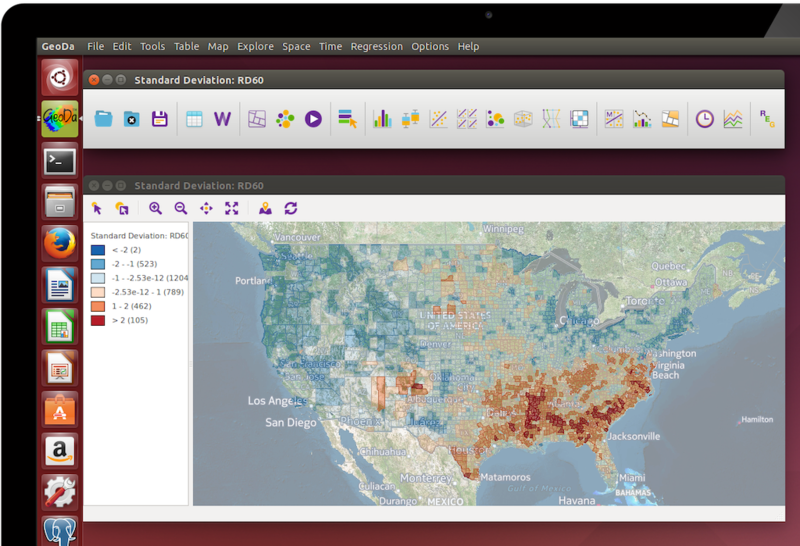 GeoDa 1.10 also continues to support more spatial file formats, full space-time data support in all views, basemap layers for all maps, averages charts, scatter plot matrices, nonparametric spatial autocorrelation (correlogram), and flexible data categorization. A new workbook is under development. In the meantime, here are interim resources, including an overview of features in 1.12. 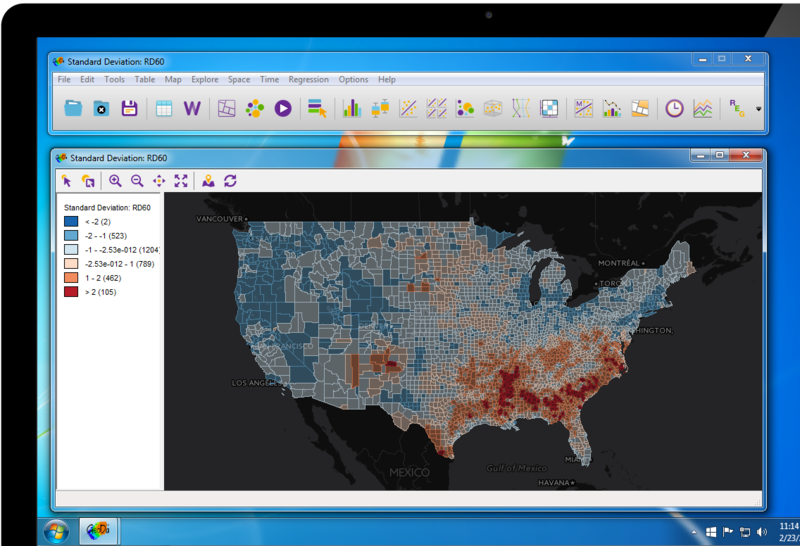 GeoDa now supports a larger variety of vector data in different formats (click here to see the details): You can work with shapefiles, geodatabases, GeoJSON, MapInfo, GML, KML, and other vector data formats supported by the GDAL library. The program also converts coordinates in table format (.csv, .dbf, .xls, .ods) to one of these spatial data formats and converts data between different file formats (such as .csv to .dbf or shapefile to GeoJSON). Selecting a subset and exporting it as a new file is now also possible. 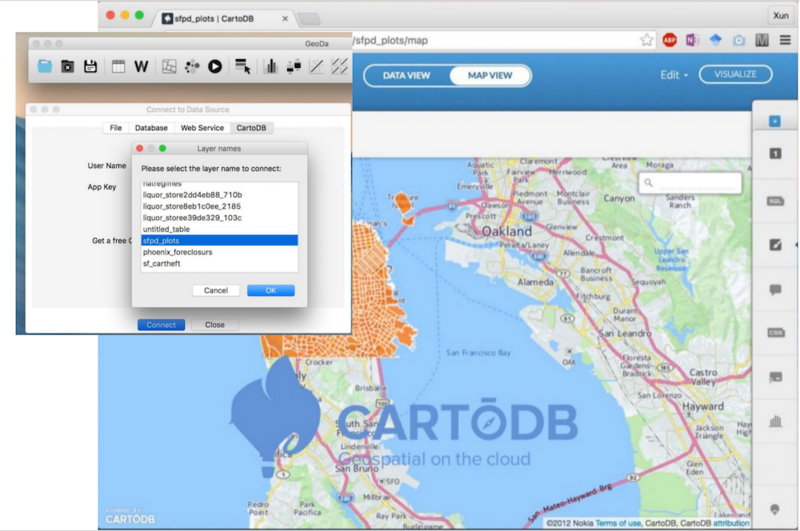 You can now load data from CartoDB into GeoDa and save results back to the CartoDB table. See how this works. 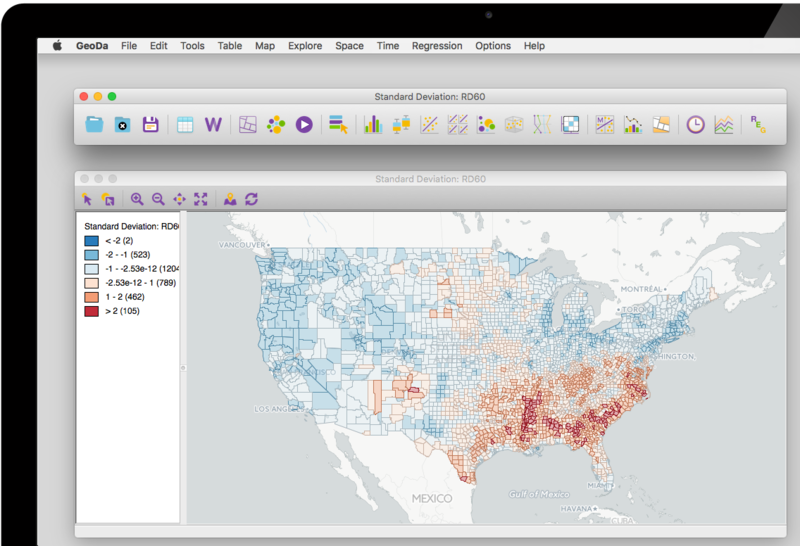 In contrast to programs that visualize raw data in maps, GeoDa focuses on exploring the results of statistical tests and models through linked maps and charts. You can now group the same variable across time periods in the new Time Editor to explore statistical patterns across space and time. Then explore results as views change over time with the Time Player. If your spatial data are projected (.prj file), you can now add a basemap to any map view, including cluster maps, for better orientation and for ground-truthing results. A new Averages Chart compares values that are averaged over time and/or space and tests if the differences in these means are significant. For instance, first select if you want to compare means of selected vs. unselected observations in the same time period or compare all observations for different time periods. A basic pre-post/impact-control test then indicates if your results changed over time and space (using an F-test and difference-in-difference test). 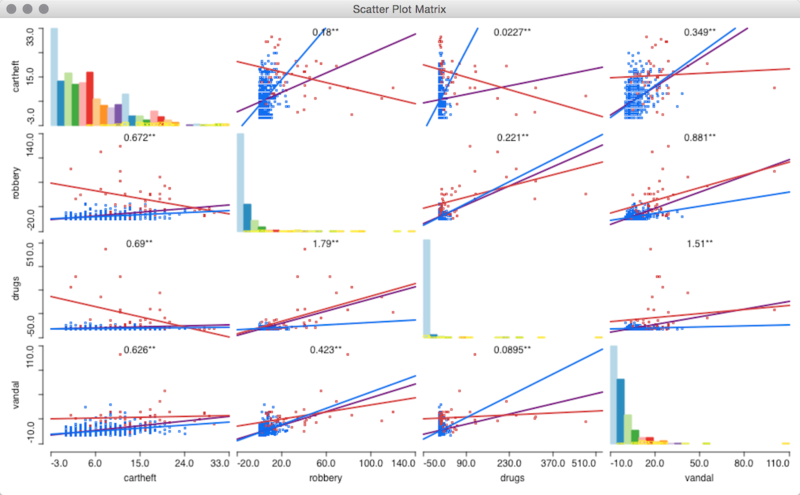 A scatter plot matrix allows you to explore multiple bivariate correlations at once. In this example, the regression slopes for selected, unselected and all police precincts in San Francisco are shown to explore relationships between four types of crime. Use a global or local Differential Moran's I test to find out if a variable's change over time in a given location is statistically related to that of its neighbors. For instance, this local (LISA) cluster map shows hotspots in New York with larger changes in the share of kids between 2002 and 2008 (and coldspots with smaller changes). Luc Anselin (2017) recently extended Geary's c with a new local indicator of spatial association. This is applied to the classic data set of "moral statistics" of France (Guerry, 1833) to show significant high and low spatial concentrations of literacy (left map) and significant associations of property crime and literacy (right map). 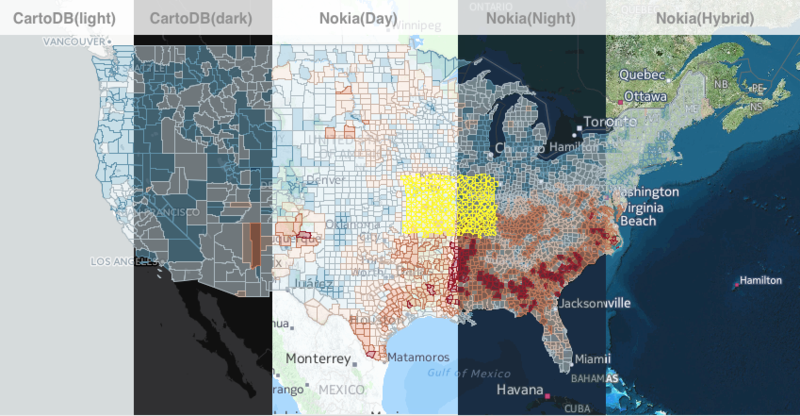 You can now map patterns of several classic non-spatial cluster techniques, including principal component analysis (left maps), k-means (top right), and hierarchical clustering (bottom right). Using the same data as in the example above, the maps below show local clusters of property crime, literacy, and suicide. A nonparametric spatial autocorrelation test (correlogram) is now available to determine distance thresholds when the values of neighboring pairs are no longer correlated. With the new category editor, you can explore how sensitive your results are to changes in the thresholds that categorize your data. In this example the thresholds in the conditional map (right) are based on the categories that can be adjusted in the category editor (left). GeoDa is released under a GPL license. It builds on several open source libraries and source-code files. Below is the list of the key projects that we would like to acknowledge. The C Clustering Library. Authors: Hoon, Michiel de, Seiya Imoto, Satoru Miyano. (2013). The University of Tokyo, Institute of Medical Science, Human Genome Center. License: Python License. Links: The C Clustering Library. The development of GeoDa has most recently been supported by the National Science Foundation, the National Institutes of Health, the National Institute of Justice, and the Agency for Healthcare Research and Quality. We are currently updating the documentation to reflect the new features in GeoDa 1.12. The Openspace listserv supports technical questions about GeoDa. GeoDa uses a GPL License (General Public License).